Alex Clarke at Denison Yacht Sales sends news of a further €250,000 price cut on his central listing for sale, the 25.07m Mangusta motor yacht Mephisto. Mephisto was built by Italy’s Overmarine yard in 2003 as one of the yard's Mangusta 80 series, and one of her key selling points is that she has less than 600 hours on her twin 2,000hp MTU engines which, coupled to twin Arneson surface drives, give her a cruising speed of 41 knots. 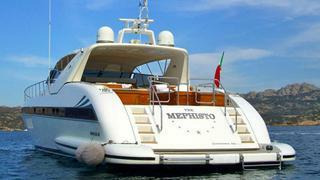 She accommodates up to seven guests in a master suite, VIP stateroom and a twin cabin plus two crew. All staterooms have satellite televisions and full en suite bathroom facilities. In September 2013, she completed a scheduled winter refit with new exterior paint, upgrades to the interior décor and a full service of the engines and generators.